GAMSMAP is a collection of GAMS routines and data files to create specific MapInfo© maps. The tools grew out of a project we did with one of our clients in which we sought to speed up by replacing hand drawn maps by automatically created maps. Because of the proprietary nature of the work, we are not able to release the geographical and related data, but provide the same general capabilities for publicly available data. GAMSMAP is not meant as a pure stand-alone mapping tool. Rather, the purpose is to show our users how GAMS can be used to interface with mapping software such as MapInfo. The GAMSMAP tools consist of three GAMS routines (region.gms, point.gms, and link.gms) with which one can create region, coordinate, and link type of maps. GAMSMAP contains a database of objects, which specify which objects the user can plot. 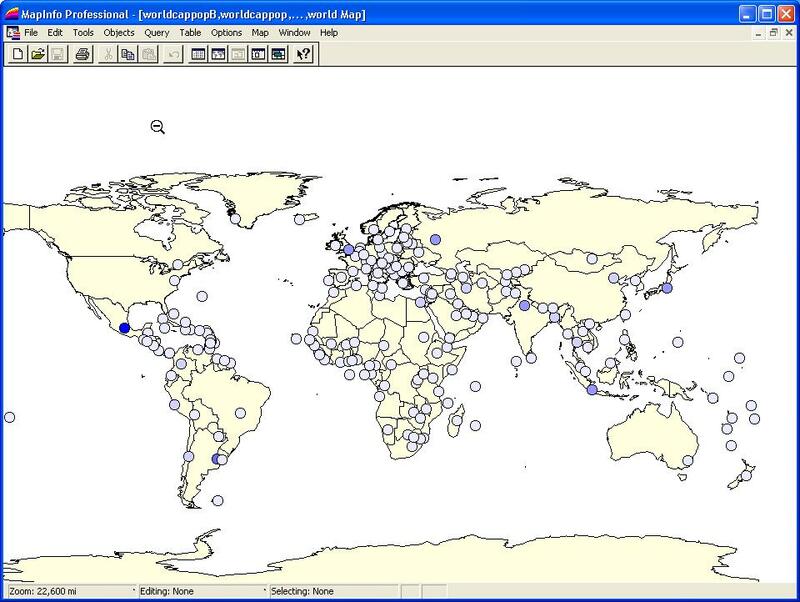 Currently the objects consist of public-domain mapping data, such as world countries, US states, world country capitals, and US state capitals. Mapping capabilities of GAMSMAP are limited to these data sets. Users may experiment with the GAMSMAP routines by adding new data sets, although the process is quite awkward at the moment. The routines in GAMSMAP are modular in design. That is, customized maps can be created by building individual map layers, for example US states, world countries, US state capitals, or world country capitals, and then merging them within the mapping software. This feature allows maps to be changed without large effort, if for example only an object on one layer is to be changed from one map to another. GAMSMAP is contributed software and not supported by GAMS, although we welcome your comments and suggestions. It was created by Michael Bussieck and Armin Pruessner. Note: GAMSMAP is not to be confused with the GAMSMAP model paperisation and cleanup tool developed by Bruce McCarl. With GAMSMAP users can create a wide variety of maps on the fly. We will give several examples which show how easily and quickly custom maps can be created. We remark that certain countries do not have any shading and are in light yellow. This is because no data exists for these countries in the sample data file. The data file is included in the GMSMAP.zip file which users can download. GAMSMAP has the option of using different scales to depict numeric data. This feature is discussed in detail in the GAMSMAP Users Guide. A windows-based GAMS system (Distribution 21.0 or later) is required to run all GAMSMAP routines and a MapInfo system (Version 6.50 or later) to view all resulting maps. While it may be possible to import maps created by GAMSMAP using other mapping software, it is recommended that users have a MapInfo viewer installed on their machine. Earlier versions of GAMS do not support the – feature to initialize environment variables from the command line. As we will see, this feature is essential to using the GAMSMAP routines. For details on this feature, see the GAMS Distribution 20.1 release notes. The GMSMAP.zip file contains GAMSMAP routines, the region, point, and link data base, documentation, and sample numeric data.Users who do not own a licensed copy of MapInfo, may download a free viewer from the MapInfo site. The software,MapInfo Pro Viewer, does not allow as much flexibility in viewing maps as the full MapInfo software. For example, it does not allow component maps to be merged. It is however useful in showing simple region maps and shows the capabilities of GAMSMAP. A GAMSMAP Users Guide in PDF format is available online. It is also included in the GAMSMAP.zip file under the Documentation/ subdirectory. To view it you will need the free Adobe Acrobat Reader. The GAMSMAP routines create standard .MID and .MIF files which can be imported to many different mapping software. Although we made use of MapInfo because our client was using this particular software, users should be able to use other mapping software, although we have not actually tested this. We made use of the free tab2tab.exe executable program to convert .MID and .MIF files to MapInfo readable .TAB files. It is open source available software from MITAB. If users prefer to use other mapping software besides MapInfo, they are encouraged to do so. Documentation/ - subdirectory containing the Users Guide. GMSMAPDB.zip - database containing support routines and map data files. region.gms - GAMS routine to create region type maps. point.gms - GAMS routine to create point type maps. link.gms - GAMS routine to create link type maps. tab2tab.exe - executable program to convert GAMS output files to MapInfo readable .TAB files. Open source software from MITAB. SampleData/ - subdirectory containing sample numeric data files. We will now show the GAMSMAP calls used to create the examples listed under Sample Maps. Users should be able to recreate the maps by following these instructions. The option –data=world specifies that our region objects are world countries. 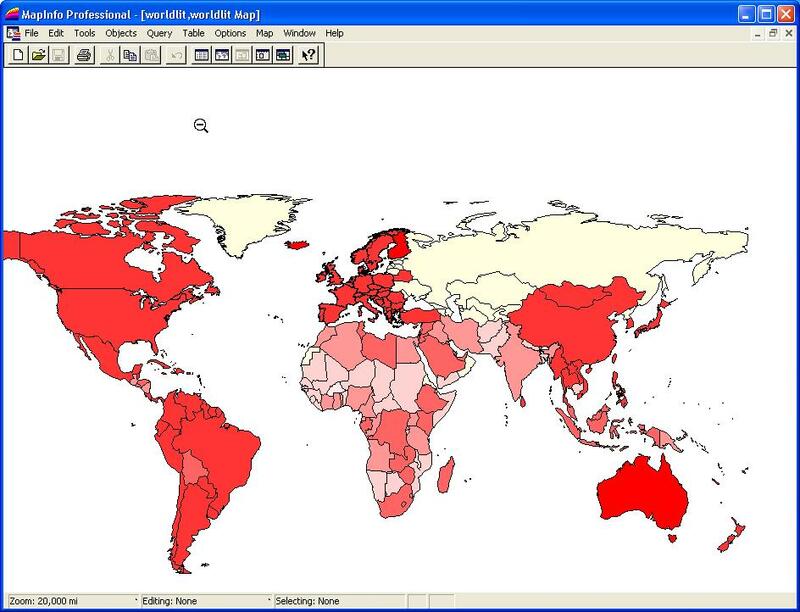 The –datafile command points GAMSMAP to the numeric data file world_lit.txt located in the SampleData/ subdirectory, –colp specifies the color of the regions with positive numeric value, and finally –tabfn specifies the MapInfo output .TAB filename. The different point type map is invoked by the command --type=color. Also, we use the default scaling. Finally, we must specify a point size (by --size=15). Otherwise our points will not be visible. All GAMSMAP –options are listed in the GAMSMAP Users Guide. Readers are referred to it for detailed information on all options.